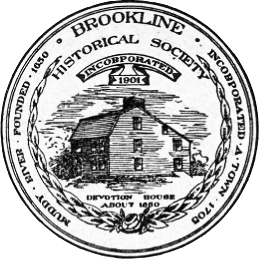 The twentieth annual meeting of the Brookline Historical Society was held in the Edward Devotion House, Brookline, on January 27, 1921, at 8 p.m., President Charles H. Steams in the chair. I have the honor and the pleasure to welcome you on the occasion of our twentieth annual meeting, and to report on the condition of our Society and its changes, and also to comment on some of the events of this our beloved town. During the year eight of our members have died; there have been three resignations, by reason of removal from the town; and there have been seven new members, six of them annual and one life member. There are now one hundred and fifty-four annual members, three life members, and four benefactors. It is evident that if we are to continue as a strong society, some accession to our numbers must be made. The majority of us are no longer young and the law of nature is making havoc in our ranks. Mrs. Agnes Brooks Vining: January 24. John Charles Olmsted: February 24. Frank S. Adams: March 5. Miss Julia Goddard: April 9. Elliot Cabot Lee: February 6. George P. Davis: November 1. Miss Harriet Augusta Howe: November 3. George E. Carter: November 23. Mrs. Vining had lived in Brookline practically all her life. She was born in Cambridge, but carne with her parents at an early age to Brookline. Her father, George Brooks, was a well-known citizen, having filled several of the public offices of the town, and being a prominent member of the Baptist Church. Mrs. Brooks was of the Corey family, a sister of Timothy Corey, and also of Miss Abby Corey, who died only two or three years ago at a great age. Mrs. Vining married rather late in life Mr. Edward P. Vining, who had lived for many years in· San Francisco and who has very recently died, a little less than a year after his wife, from the effects of an injury from being knocked down by a street car. Mrs. Vining was a lovely woman and quite active in her church. She was sixty-eight years old. Mr. Olmsted was born in Switzerland, but had been a resident of Brookline for many years. He was associated with his father, and later with his brother, in his profession as a landscape architect, being connected with the laying out of public parks and private estates all over the country. Boston's Franklin Park and the beautiful approach to it, known as the Fenway, Arborway, Jamaicaway, are of their planning. Mr. Olmsted married Miss Sophie White, a sister of our devoted member, Charles F. White, and leaves a wife and two daughters. He had been in ill health for many months. He was sixty-seven years of age. Frank S. Adams came to Brookline in 1899, and lived on Mason Terrace. He was in business in Boston, and not an active member of our Society. He was sixty-nine years old. Miss Julia Goddard was well known and dearly beloved by the members of our Society. She was one of its original members, and a regular attendant at its meetings until her illness, and contributed of her strength and money to its welfare. Her most interesting paper, giving an account of "Green Hill," as she called her home, is well remembered, and is among the valued papers that we have published. According to her account, her father bought the estate in the summer of 1838, when she was but a little more than a year old, and she lived and died there. She was greatly interested in historical matters, and was intensely patriotic. Her home was a museum of antiques, some of them of great value, and those who were privileged to call upon her will remember the fine reception room with its wall paper, which I think had been upon its walls since her family moved there. The house itself is a well-preserved specimen of the houses of the early part of the eighteenth century, it having been built about 1732. Her pleasant account of her home was written in the fall of 1911, and Miss Goddard's health failing her soon after, she had since taken no active part in our meetings. She was eighty-three years of age. Elliot Cabot Lee was the eldest son of Henry Lee, the founder of the house of Lee, Higginson & Company. He was a great reader and had a fine collection of books; but only for a short time was he engaged in business. He died at Camden, South Carolina. He was about sixty years old. George P. Davis was a native of Boston, and for many years was engaged in business there. He married the eldest daughter of Elijah Emerson, a wealthy merchant, who built the house now standing on Davis Avenue, but which originally stood at the end of Washington Place, now a part of Davis Avenue, and was surrounded by a large and beautiful garden, a portion of which is the present "Emerson Garden," a public park, particularly for mothers and young children. Mr. Davis had lived in Brookline a number of years and was interested in our Society, occasionally attending its meetings. He was quite athletic, and will be remembered as a bicycle rider until he was upwards of eighty. His fall, a few years ago, resulting in a broken hip, put an end to his riding. He recovered sufficiently to walk with crutches. He lived to be ninety years old. Miss Harriet Augusta Howe was the eldest child of Thomas Howe, a wealthy Boston merchant, who came to Brookline about 1850, and bought the house on Linden Street where Miss Howe died. The house was built about 1843 or 1844 by John Faxon, and the land adjoins that of the house formerly occupied by James Harrison Fay, whose death was spoken of in last year's report. For the past ten years Mr. Fay and Miss Howe were the sole occupants of these adjacent houses. In their day these were fine residences with beautiful surroundings; but the growth of the town, and the erection of apartment houses in the immediate vicinity, have much diminished the beauty of these places. Miss Howe and her sister Louise, who died about ten years ago, were interested in our Society. Miss Louise Howe wrote a paper on the life of Rebecca Nourse, a victim of the witchcraft tragedy. Miss Harriet Howe was in her eighty-seventh year. George E. Carter had lived in Brookline but a few years. He had a beautiful home on Beacon Street; but died away from Brookline. He was sixty-seven years old. Since the new year there have been two more deaths, Dr. Moore and Dr. Blanchard, more extended notices of whom will be made another season. John J. Richards of Aspinwall Avenue, who lived to the age of eighty-one. George J. Quinsler of Washington Street, a well-known carriage builder, was aged seventy-five. Anson M. Lyman of Buckminster Road was a lawyer who devoted much of his time in the service of the town, in the period of the draft act in the late war, and to whom Brookline owes much for his tact and faithfulness in his trying position. He wrote a paper entitled "The Literature of the Bible," for the Thursday Club, of which he was a member, and afterwards read it before our Society. It was an extremely interesting paper, and of great literary merit, and presented in strong light some of the finer passages of the Bible. He was sixty-one years of age. Martin Kingman will be remembered by our members as the author of a paper describing Brookline Village about 1865 or 1866. He was a native of Bridgewater, coming to our town about 1863, and had a dry goods store in the building on Washington Street, next to the store formerly of Seamans. At that time the communications with Boston were not as numerous as. at present, and his store was well patronized. He gave this up years ago and had an agency for fire insurance companies. He lived in a house on the comer of Washington and Thayer Streets, next to the Fire Engine House. This was bought by the town a few years ago and the house moved away. 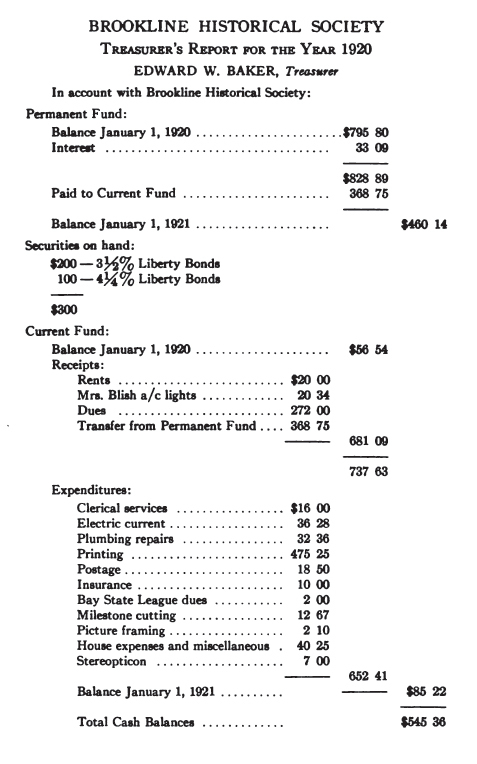 Mr. Kingman was a member of the first Board of Directors of the Brookline Savings Bank, established in 1871, and served until within a few months of his death. He was eighty-five. Charles E. Lauriat was a native of Boston, of the well-known firm of Estes & Lauriat, afterwards the Charles E. Lauriat Company, book publishers, a very intelligent and agreeable gentleman. He lived to be seventy-nine. Mrs. Elizabeth G. Rice was the widow of David Hall Rice, a prominent lawyer in his day. Mrs. Rice lived in the old Hugh R. Kendall house on Wellington Terrace. She was formerly a school teacher in LoweD, and was a prominent member of the Harvard Church. She was aged seventy-five years. Robert M. Hand will be remembered as a house painter succeeding his father, James B. Hand, a former Selectman. Mr. Hand and his father had occupied the same shop for nearly fifty years. He was sixty years old. Mrs. Lucy A. Collins was the widow of Henry Collins, an early expressman and afterwards a provision dealer, aged eighty years. Stephen G. Train, a Boston merchant, who had lived for many years on Chestnut Place, adjoining the Sargent estate, was aged eighty years. Miss Sarah W. Bowman was a former resident of Pleasant Street; aged ninety-two. Daniel L. Prendergast, a charitable gentleman, was connected with the Boston Elevated and much interested in the anti-tuberculosis hospital; aged sixty-two. Granville C. Tyler was a former resident of Harvard and Babcock streets; aged eighty-three. General Charles Russell Suter, U. S. Army. was aged seventy-eight years. 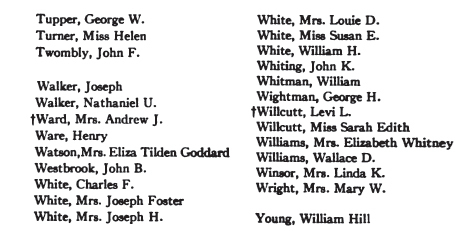 Mrs. Julia E. Craig was the widow of our former Selectman, William Craig, aged seventy-three. Henry G. Spaulding was a Unitarian clergyman, and wrote many religious books. Mr. Spaulding had lived in the apartment house known as the "Colchester" for many years. He was eighty-three. Mrs. Almira T. Wyman, who had lived on St. Paul Street, was ninety-two. Mrs. Elizabeth Rogers Mason Cabot, the widow of Walter Cabot of Heath Street, was well known to the former generation, being active in good works and a lovely lady. She had been in ill health for many years. Aged eighty-five. Augustus P. Calder was greatly interested in agriculture and horticulture, and a successful grower of plants. He was a native of Mattapan. Aged eighty-three. Thomas Donlon was an employee of the town and an honest, hard-working man. Aged sixty-nine. Miss Emma Taylor Lewis, of a most estimable character, was a school teacher for many years in the Brookline schools. Aged eighty-seven. The advanced age of the above people speaks well for the healthfulness of the town. Wednesday evening, January 28,1920. The annual meeting at which reports were read and officers elected. Your president read his annual report, giving a brief account of our members who have passed away, as well as of some well-known citizens outside of the Society, and noting some of the changes in the town. Wednesday evening, March 31. Mr. George Andrews Moriarty of Boston read a paper entitled, "The Early Land Titles of Longwood." Although this was called a paper, Mr. Moriarty made his talk exceedingly interesting, not confining himself to his written page, and the discussion that followed was participated in by several of the company. The old owners of the part of Brookline known as Longwood were Aspinwall, Sewall, Thorndike, Francis, later Sears and Lawrence,' and their holdings were pleasantly described. It was particularly interesting to your president, who had lived all his life in this locality. Wednesday evening, April 28. This meeting was held in the hall of the Public Library, and a paper was read by J. Gardner Bartlett of Boston, entitled "Ancestor Hunting in England." Mr. Bartlett, who is assisted by his wife, is a professional searcher after possible English ancestry, and his paper consisted largely of the difficulties attending this work, and some of the humors thereof. It was illustrated by lantern slides showing some of the cathedrals and other buildings containing the court records, and illustrations of the lists of names that he had to decipher. Wednesday evening, May 26. At the Devotion House, Mr. Charles F. Read read a paper containing the Diary of Cornet Noah Chapin of Somers, Connecticut, a soldier of the Revolution, who was stationed at Roxbury from June to September, 1776. This diary told of the impressions made by the Battle of Bunker Hill on the soldiers, with some allusions to Brookline. Thursday evening, November 11. The fall meeting was held in the hall of the Public Library, and the speaker was Mr. G. Raymond Roberts, Commercial Manager of the New England Telephone and Telegraph Company, who explained with the help of lantern slides and moving pictures the construction and use of the telephone as shown behind the scenes. Mr. Roberts was well fitted to explain the wonderful mechanism of the telephone, and his illustrations showed how intricate and yet how effective were the means employed to serve the public. His descriptions of the means taken for the comfort of the numerous employees of the company showed, how well they are cared for both physically and mentally. Numerous questions were asked by the audience, which were satisfactorily answered by Mr. Roberts, and we felt well repaid. The growth of this aid to business and pleasure has been wonderful. In addition to these regular meetings, we had a novel and very interesting gathering, largely under the auspices of our Society, in the hall of the Devotion School, on April 19, 1920, Patriots' Day, to commemorate the ride of William Dawes, who was one of the messengers sent to warn the towns between Boston and Concord on the night of April 18, 1775, of the corning of the British troops to destroy ammunition stored at Concord. On that occasion two messengers were sent by the Committee of Safety, Paul Revere by the way of Cambridge, crossing the Charles River in a boat, thence to Somerville, Medford, Arlington, and Lexington, and his ride has been commemorated and reproduced for many years. The other route was over Boston Neck, Roxbury, Brookline, and Cambridge and Arlington, and thence by the same route as the former. This was undertaken by Major William Dawes, who was the grandfather of our deceased friend, Miss Julia Goddard. For some reason his ride has not been commemorated until now. But last year, by the united efforts of a committee from the several towns along the route, a plan was formed to reproduce, as well as might be done, Major Dawes' ride. 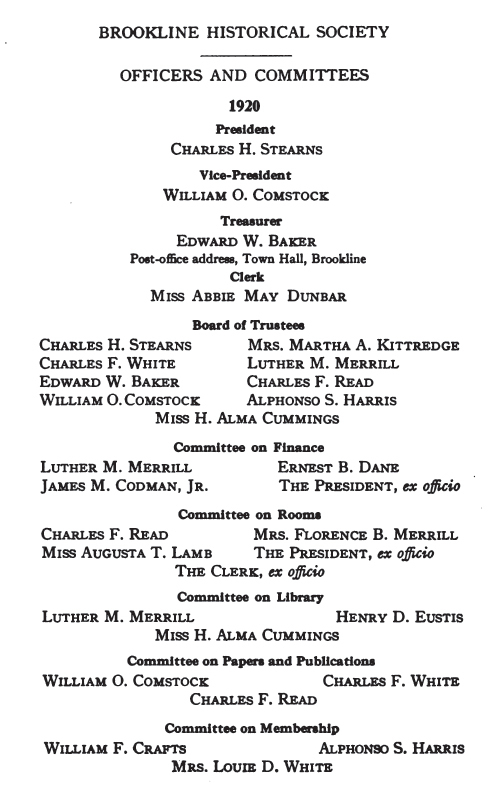 Our efficient treasurer, Mr. Baker, was the member of this committee representing Brookline, and the successful carrying out of the program at least as far as our town was concerned, was well attested by the gatherings along the way and at the hall. A gentleman from Lexington, selected for his strong resemblance to Major Dawes, accompanied by several members of the Roxbury Horse Guards, rode over the route in the morning hours, on horseback, stopping occasionally at various points, and at the Edward Devotion House. The rider dismounted and was ushered to the platform of the hall, where a number of prominent citizens had gathered, and he received a royal welcome from the audience. Mr. Baker explained the occasion, several patriotic songs were sung, Major Dawes spoke a few words, then was escorted out of the hall and mounted his horse, and the cavalcade rode away towards Cambridge. It was a bright, clear day and the occasion made a very pleasant and instructive way of celebrating the holiday. Many expressed the hope that this might be repeated another year. 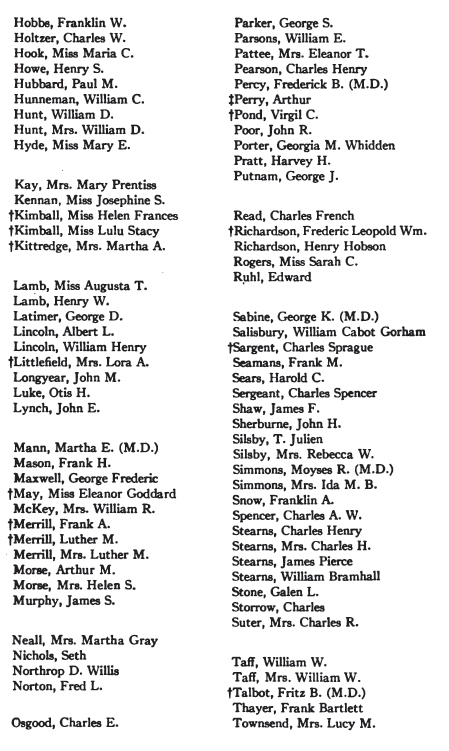 Besides these meetings there have been four meetings of the Bay State Historical League, of which our Society is a member, at each of which meetings we have been represented by two or more delegates. The first meeting of the year was held in Boston on Saturday afternoon, January 4, in the old Harrison Gray Otis House, a stately mansion of the old style, on the comer of Cambridge and Lynde Streets, and owned by the "Society for the Preservation of New England Antiquities." An interesting and instructive paper was read by John A1bree of Swampscott, on the Bay Psalm Book, and illustrated by the singing, by a quartet, of some of the old tunes. This old mansion, which was open to the guests, contains a wonderful collection of antiques, including a fine lot of old pewter ware. The meeting was a most enjoyable one. The second was held also in Boston, in the afternoon of April 24, at the rooms of the Massachusetts Historical Society, at which, after the usual business, the Secretary of the Society gave an address, telling something of the Massachusetts Historical Society, its history, and the various collections, manuscripts, and books in its custody, which were later viewed by the company. The third, or summer meeting, was at Concord on June 19. It was a beautiful day, and the old town of Concord was looking its loveliest. The business meeting was at the Court House, afterwards adjourning to the rooms of the Antiquarian Society. A whole house is completely filled with interesting historical and antiquarian articles, many being of great value. It is a most wonderful display, and the pity of it is that it is housed in an old-fashioned wooden building liable to destruction by fire. Later we were treated to a ride about the town, and to a walk through Sleepy Hollow Cemetery, where, as one speaker expressed it, the glory of Concord lies buried. The fourth, or fall meeting, was held at the city of Methuen, in a building on the Searle estate. Besides the business, a very interesting talk was given by Mr. Mann, a long resident of Methuen, illustrated by lantern slides of many beautiful spots about the town and on the Merrimack River, and also of some of the buildings and grounds of the Searle estate. It was a very pleasant meeting, the only drawback being the great heat of the day, and the rather roundabout way of reaching the place. At each of these meetings a lunch was served, which gave an opportunity for a social mingling of the members. Coming to town affairs: there have been an unusual number of transfers of real estate, largely owing to the growing scarcity of houses, owing to the continued high prices of materials and labor. But little building has been done. None of the three or four-story apartment houses, a few single houses in the Fisher Hill district and in Longwood, and two or three large automobile establishments on Commonwealth Avenue have been built. Mention was made in last year's report of the demolition of a fine residence on Beacon Street, to make room for a large banking house, and during the past year another substantial residence on Beacon Street, nearly opposite, has been tom down and a row of stores built in its stead. Indeed, one must see that Coolidge Comer is to be devoted entirely to business. How far on either side of the comer of Beacon and Harvard Streets this may extend, it is impossible to predict. In commenting on the changes during the past year, the important change in the status of women in the political world must not be forgotten. 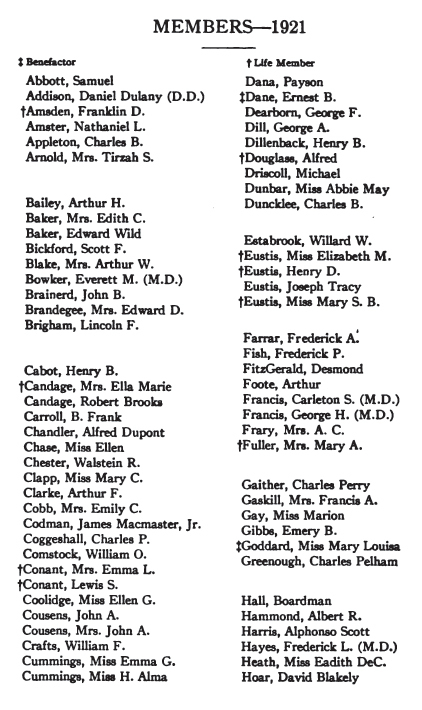 Last fall, only about two months before the day of the Presidential vote, the last state necessary to make legal the complete franchise of women passed the Act, and immediately there began the necessary machinery for registration, preparatory for voting, and women by the millions flocked to the various places designated, to have their names inscribed as voters. In our town upwards of eight thousand were placed on the lists, outnumbering slightly the men. It was wonderful how simply, easily, and with very little aid, these women appeared at the polls and cast their first vote for President and Governor. Even those women who were pronounced anti-suffragists conscientiously felt it their duty to obey the law and were enrolled. Another wonderful change took place in 1920. It was the first year under the law prohibiting the sale of intoxicating drinks, and although it was impossible to enforce entirely such a drastic change, the results of the closing of the saloon have been wonderful. Coming to our own Society, our meetings have been well attended and interesting. It is to be hoped that we may have the aid of our local members in papers prepared for our meeting, and not have to depend so much upon outside talent.